Become a Spelling Bee champion is a question that may arise in many minds but not everyone at the end becomes the champion. The champions are not born to win. These champions are made champions through developing certain skills and knowledge. It is not an easy job to learn numerous words and spell them correctly. It takes a lot of study and concentration to win the championship. Everyone has the ability to compete in spelling bee championship but it is a skill that is developed from the ability that makes a person the champion. Fortunately, there are certain techniques and methods that can help a person to become Spelling Bee Champion. Let us assume that you are preparing your child for Spelling Bee Championship. You need to take your child to some spelling bees that are happening nowadays. The child needs to observe it carefully. The question contestants ask from the officials. They can ask for the definition of a certain word or from where the word is originated. Take a close observation about the pace of contestants while spelling out the word. The contestant may go slowly so that they do not make any mistakes in a rush. Take a closer look at the contestants’ behavior and how do they manage the pressure. Children are mostly introvert at the age when they contest for spelling bee championship. They feel hesitant at public speaking. It would not be a good idea to keep the preparation on paper. You need to take oral tests from the child. It will take away their fear of public speaking and it will give them confidence as well. The final rounds of spelling bee are oral. You need to gather some people in front of whom the child can perform oral spelling test. The audience here would give him encouragement to perform in the spelling bee. A child should be given a space where he can read and learn things on his own. He should not have any supervisor to guide him. A solitary study is hard but it gives the best results. One has to think about everything on his own. The more effort child makes to understand, the better outcome there would be. 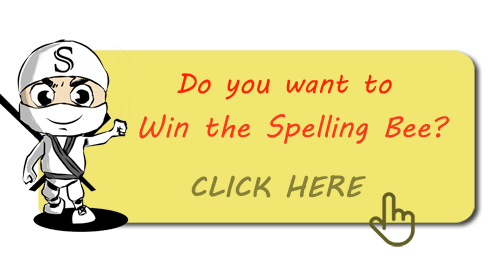 Take spelling tests and identify the words that child do not spell correctly. You would find a similarity among the words that you identified. The similarity can be the structure of the words or the category of words. You need to make a procedure through which the child can learn to spell these kind of words. If it these are some words which can be pronounced in a similar way. You can make a list of those words that these words are pronounced similarly. Utilize all of the resources that are available for practicing spelling bee. It may be the dictionaries, study guides or the encyclopedia. If some word is derived from another language, do tell the child about it as it would help the child in remembering the word. Get a Spelling Bee Ninja account: the number one and only professional spelling bee training system. 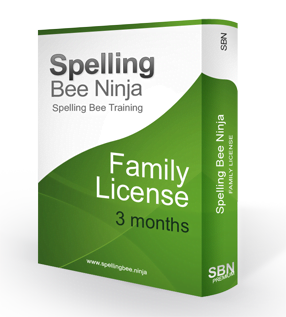 This system will help you to increase your spelling capabilities very quickly, the perfect tool to win the Spelling Bee.